The library at Webster Vienna brought some furry friends to help students, faculty and staff de-stress during finals week. With finals and the end of the semester approaching, the Webster Vienna campus offered students a range of services to handle stress and time management -- from a soothing puppy visit to a "Night Against Procrastination" with the Writing Center. The "Night Against Procrastination" on Dec. 3 was a hit with students, providing them with a comfortable study space at a critical point in the final weeks of the semester. Reference librarians and assistants, Writing Center tutors and counseling center staff were available until 10 p.m. to work with students to help them make progress with their papers and assignments. Staff purposely selected an evening in Week 6 (14) in order to encourage students to get working on their projects and assignments before their deadlines in weeks 7 and 8. The Library offered workshops on search strategies; the counseling center offered workshops on relaxation and on avoiding procrastination; and the Writing Center held 5 sessions on common grammar mistakes, writing introductions and conclusions, structuring essays, integrating sources, and clarity and style. Fahrenheit 145, a new start-up catering service run by two students, Michael Kamberov and Marin Tikvica, generously provided free food for their hungry peers during the event. Events like the Night Against Procrastination make the issue of time management visible to students and opens up new understanding of the writing process. Student feedback on the event was very positive by undergraduates and graduates alike. "This is such a great service!" said Ainur Kalitova, a master's student who visited all of the Writing Center’s workshops. "I finally understand how to fix many of the mistakes I was making." Junior librarian Nicole Platzer also expressed how appreciative the students were of the longer opening hours. “Many students used the opportunity to get their papers and assignments done, with library staff and writing center tutors ready to assist them when needed,” Platzer said. See more photos from the evening in this album on Flickr. Separately, as the final week arrived the Webster Vienna Library organized a visit by three cuddly, four-legged guests to help students, faculty and staff de-stress during finals week. Almost 70 people participated in the Dec. 14 event, which was sponsored by the Student Government Association. Tashi, Delek and Anthony are certified therapy dogs with much experience, yet they remain open-minded. “We have been to schools, geriatric institutions and hospices, however, visiting a university was new to us. It was a very positive experience and we would be happy to come again”, says Gertraud Mark, the owner and trainer of the dogs. 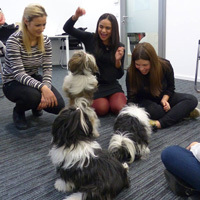 Studies have shown that physical contact with a pet has many benefits including lower blood pressure and feelings of comfort and calm, and the many smiles on the students faces certainly reflected that. See more photos of students interacting with the dogs in this Webster Vienna Facebook post. 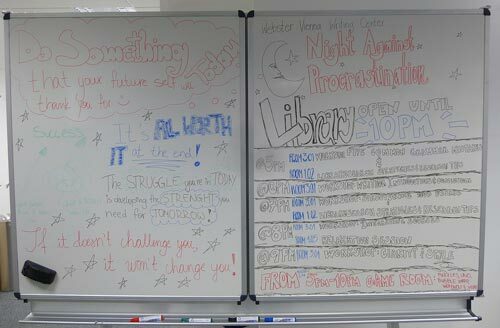 The first Long Night Against Procrastination was held in 2010 at a university in Germany after students complained about their procrastination habits. "Procrastination is a phenomenon that we, as writers, all know too well," explains Lydia Wazir-Staubmann, the head of the Writing Center at Webster Vienna who provided much of the information for this article. "Writing is too often associated with lonely suffering. Events like The Long Night make the issue of time management visible to students, who, as novice writers, might not be aware that writing can also be done in company. If writers can find their flow, unleash their creativity, and experience the success of a convincingly expressed argument, their writing can be a joy. "The Long Night opens up academic writing to its more joyful aspects through company, conversations, and healthy and relaxing interruptions, like relaxation sessions. In university contexts, this aspect of writing often gets lost under the burden of assignments, deadlines, and the pressure of grading."